Meet the Pilot | Hot Air Balloons Fly High in Rock Hill! Commercial pilot Rob Sarratt has been involved in ballooning since 1982. His love of the sport has taken him to the Albuquerque balloon rally several times, crewing with fellow pilots and crew. He has been flying his own balloon since 2004. His favorite time of the year to balloon is in the fall, enjoying the cool weather and colorful display of red, orange and yellow leaves. Of course, there is no “unfavorite” time to fly for a balloon pilot! 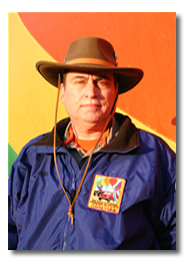 Robert Sarratt is fully licensed by the FAA and is a member of the Balloon Federation of America.